Typically homeowners and potential homeowners measure the financial viability of their purchase in two ways; the price of the home and the monthly payment. Very surprisingly to most, they both do not depict the same overall picture when examined in comparison to other factors affected by the current economy at the time. To help illustrate exactly what benefits lie in seizing the low interest rate and housing price opportunities that are out there right now, we’ve assembled a simple comparison chart (also explained on the video blog). This chart shows you exactly how much you are getting for your monthly payment. If you haven’t been convinced already, this will surely convince you that buying now is the single best thing you can do for yourself and your family. As a Realtor, the most exciting thing to witness in terms of how much (or how little, I should say) it costs each month to be in a home these days. The reason this is especially exciting is apparent when, looking at the chart, the other things are compared. Take a look at what happened to the average cost of a new car between 1989 and today. It jumped up to a few hundred dollars short of double the average price! Bread rose in price almost four times as much and the same holds true for gasoline. But what is very interesting is how the numbers look for housing, mortgage and monthly payments. What you’re seeing is mainly a demonstration of just how significant the impact of interest rates is on relative affordability for housing. Despite such huge jumps in cost for the other items on our chart, the median home price has increased 70% and interest rates are at less than half of what they were twenty-one years ago. In fact, the most noteworthy figure that does not deviate at all from that of almost a quarter century ago is the monthly payment. 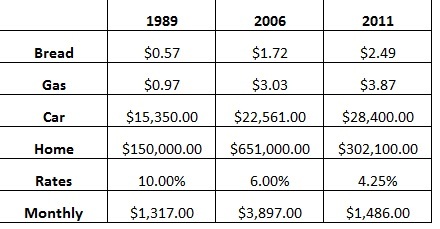 A very eye-opening way to say this: you can buy a home today and pay the same monthly payment as in 1989. Considering how the market is today and the impending rise of interest rate that will occur – it is imperative that homeowners, potential buyers and investors keep their eyes on the prize when it comes to negotiating a final price. There is nothing more disappointing for me as a Realtor than to see a buyer wasting the long-term savings and investment opportunity that is gained by these low rates and prices, on a few thousands dollars or a couple percent of the total price. If you work out the numbers, there is a very good chance that the savings from today’s interest rate alone will pay you back multiple times over the years. To calculate this, use an online tool to estimate your amortization schedule. You will be surprised. Remember, if you compare the difference between a slight decrease in the price of a home versus a slight increase in interest rates – there is a far more significant impact on the overall cost of the loan with the interest rate increase. We have been watching the market continue to allow us fantastic rates for several years now but when you factor in the financial volatility we are experiencing lately, with the stock market as well as the overall economy – there is no telling just how soon those interest rates will creep back up. Not only that, let’s hope they don’t go back up to the astronomical rates we saw in the low to mid- 80s, reaching levels as high as 18%! People who are in tune with the ins and outs of the real estate industry are buying and investing in homes as much as they can these days. Top Realtors, including myself, are taking advantage and getting into second homes, vacation and rental properties and anything else they can afford at the moment. At the end of the day, these properties will appreciate. The market will recover. And those people who were smart enough to get in on the action today, will end up with low, locked-in mortgage rates and monthly payments plus plenty of equity in homes worth far more than they are today.